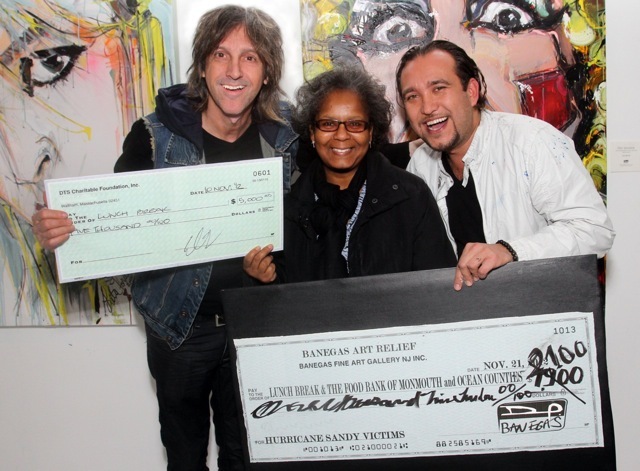 On Wednesday, November 21, 2012 artist David Banegas of Banegas Gallery and renowned rock photographer, Mark Weiss, teamed up to raise money for Lunch Break and the Food Bank of Monmouth and Ocean Counties. The two artists raffled off their art with all proceeds to be split by the two organizations, both feeling the strain in the aftermath of Hurricane Sandy. Since the devastating storm struck the shore less than a month ago, the food bank alone has distributed food for more than one million meals in our community. The event took place at Banegas Gallery, 43 Broad Street in Red Bank, where Gwen Love, Executive Director of Lunch Break, picked the two winning tickets. The winner of the original Banegas “Marilyn Monroe” painting, valued at $4,000, went to Robin Smith of Monmouth County. Nick Fabbelle of Red Bank won the unique “Blondie” giclee, a Banegas-Weiss collaboration from a photograph Mark shot of Debbie Harry in 1981 and embellished with paint by David Banegas. The raffle brought in $2,100.00. 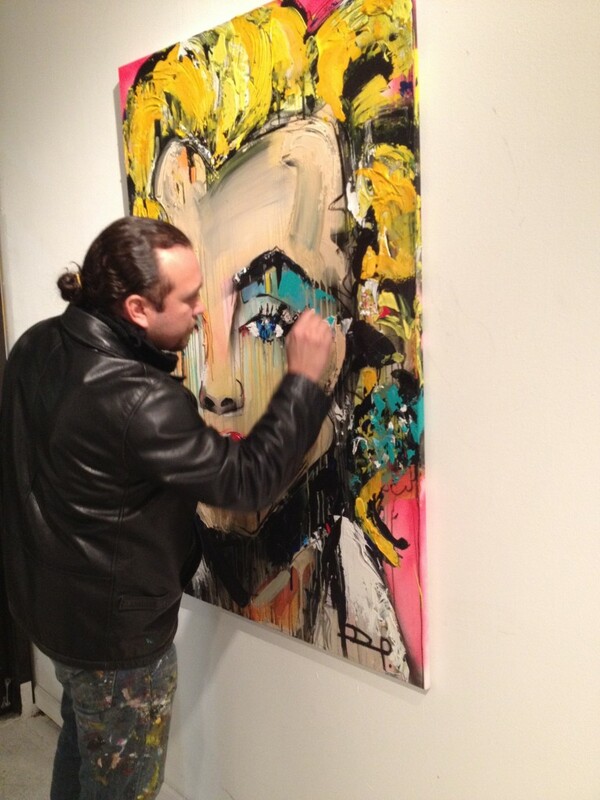 Artist David Banegas paints Marilyn Monroe at an event; Artist David Banegas with Debbie Harry of Blondie and photographer Mark Weiss at the Banegas Gallery in Red Bank, NJ in August 2012. Weiss presented a check to Gwen Love for $5,000 from the DTS Charitable Foundation, a direct result of his “FEELS LIKE THE FIRST TIME” campaign, which began a year ago at the October 2011 Lunch Break Gala. Weiss says: “It’s official--this $5,000 check is from Tom Sholz of the Band BOSTON. Tom’s wife Kim sent me this check with the kind words to our community and Lunch Break: ‘Boston sending love to New Jersey. 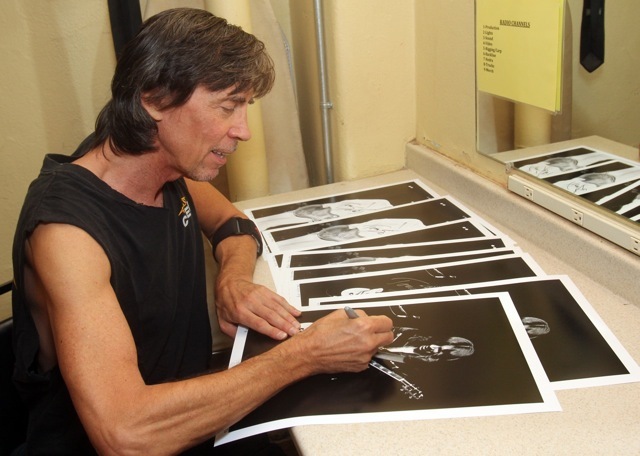 Be well and stay strong.’” Weiss hopes this is just the beginning of larger donations as he reaches out to the rock ‘n roll community on behalf of Lunch Break. 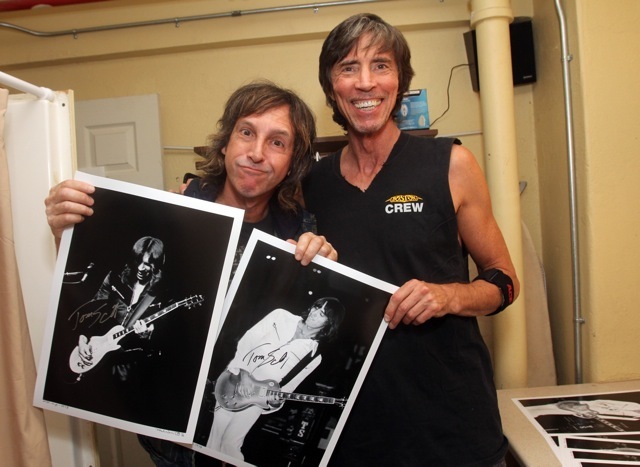 As part of Weiss’s FEELS LIKE THE FIRST TIME campaign, Tom Sholz from BOSTON signs a photo that Weiss shot of him in 1977!